Asylum is a complex area of immigration law and policy. While much of the recent debate surrounding asylum has focused on efforts by the Trump Administration to address asylum seekers arriving at the U.S. southern border, U.S. asylum policies have long been a subject of discussion. The Immigration and Nationality Act (INA) of 1952, as originally enacted, did not contain any language on asylum. Asylum provisions were added and then revised by a series of subsequent laws. Currently, the INA provides for the granting of asylum to an alien who applies for such relief in accordance with applicable requirements and is determined to be a refugee. The INA defines a refugee, in general, as a person who is outside his or her country of nationality and is unable or unwilling to return to that country because of persecution or a well-founded fear of persecution on account of race, religion, nationality, membership in a particular social group, or political opinion. Under current law and regulations, aliens who are in the United States or who arrive in the United States, regardless of immigration status, may apply for asylum (with exceptions). An asylum application is affirmative if an alien who is physically present in the United States (and is not in removal proceedings) submits an application to the Department of Homeland Security’s (DHS’s) U.S. Citizenship and Immigration Services (USCIS). An asylum application is defensive when the applicant is in standard removal proceedings with the Department of Justice’s (DOJ’s) Executive Office for Immigration Review (EOIR) and requests asylum as a defense against removal. An asylum applicant may receive employment authorization 180 days after the application filing date. Special asylum provisions apply to aliens who are subject to a streamlined removal process known as expedited removal. To be considered for asylum, these aliens must first be determined by a USCIS asylum officer to have a credible fear of persecution. Under the INA, credible fear of persecution means that ﷿there is a significant possibility, taking into account the credibility of the statements made by the alien in support of the alien’s claim and such other facts as are known to the officer, that the alien could establish eligibility for asylum.﷿ Individuals determined to have a credible fear may apply for asylum during standard removal proceedings. Asylum may be granted by USCIS or EOIR. There are no numerical limitations on asylum grants. If an alien is granted asylum, his or her spouse and children may also be granted asylum, as dependents. A grant of asylum does not expire, but it may be terminated under certain circumstances. After one year of physical presence in the United States as asylees, an alien and his or her spouse and children may be granted lawful permanent resident status, subject to certain requirements. The Trump Administration has taken a variety of steps that would limit eligibility for asylum. As of the date of this report, legal challenges to these actions are ongoing. 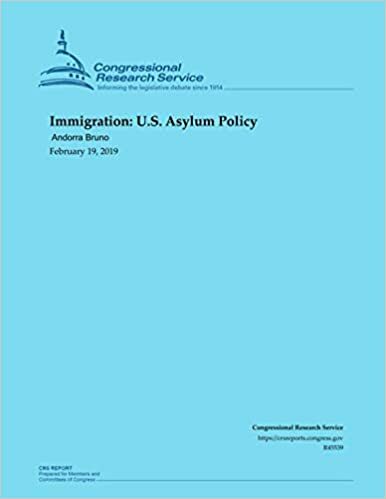 For its part, the 115th Congress considered asylum-related legislation, which generally would have tightened the asylum system. Several bills contained provisions that, among other things, would have amended INA provisions on termination of asylum, credible fear of persecution, frivolous asylum applications, and the definition of a refugee. Key policy considerations about asylum include the asylum application backlog, the grounds for granting asylum, the credible fear of persecution threshold, frivolous asylum applications, employment authorization, variation in immigration judges﷿ asylum decisions, and safe third country agreements.